Founded in 1965, The Moscow State Opera is the touring name of The Moscow State Opera & Ballet Theatre named after Natalia Sats. The company is a full-scale opera and ballet theatre with its own Symphony Orchestra of over 100 musicians, an Opera division of over 75 singers, a Ballet division of 60 dancers, and all soloists and musicians are graduates in higher musical education from The Moscow Conservatoire or similar establishments in Russia. Uniquely, the company gives young audiences access to musical culture. The theatre produces a vast programme geared to suit children, young adults and families, ranging from the classical and contemporary to opera and ballet, symphony concerts, and educational and social programmes. Since appointing the new Artistic Director, George Isaakyan - Honoured Artist of Russia, State Prizewinner of The Russian Federation Laureate, and Golden Mask Laureate - the theatre has flourished and spread its wings. It now tours regularly overseas and features guest artistes from many of the great opera theatres of Russia including The Bolshoi, The Stanislavsky, and The Mariinsky. 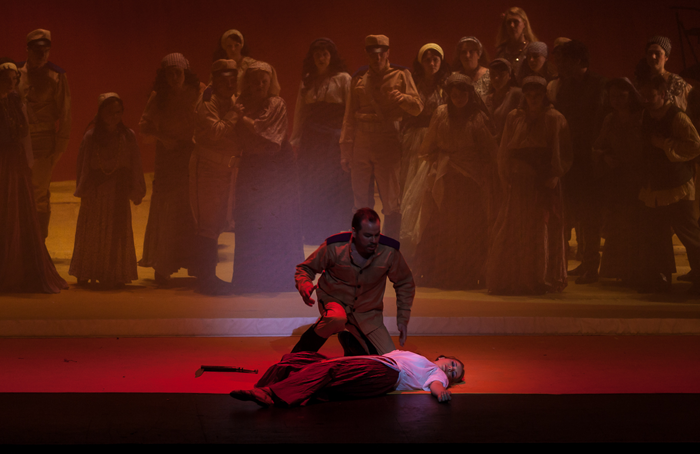 The Moscow State Opera visited Dublin in 2013 with their much-acclaimed production of CARMEN featuring Celine Byrne, Ireland's own international soprano star. The Perm P. Tchaikovsky Opera and Ballet Theatre, to give the company its full title, is one of Russia's oldest and most distinguished theatres along with The Bolshoi in Moscow and The Mariinsky (Kirov) in St Petersburg. The company tours extensively internationally with recent tours to The Netherlands, Spain, France, The USA and Canada, and has visited Ireland three times in the last ten years. The city of Perm has an honoured place in ballet history, not only with its connections to Tchaikovsky, but it was also the home of Sergei Diaghilev, the towering genius of 'Ballet Russe', who launched Anna Pavlova and Vaslav Nijinsky onto the European stage. During the Second World War the famous Kirov Opera and Ballet Theatre (now Mariinsky) sought refuge in Perm and many of the same high standards and styles of the two companies can be traced to that period, The Perm Ballet is very unusual in that it draws nearly all its dancers from its own school and The Perm Ballet School is one of the most respected ballet schools in the world. In 2013 the company brought its new production of Sir Kenneth MacMillan's Romeo & Juliet to Dublin earning standing ovations for every performance and a glowing 5-star review from the ballet critic of The Irish Times - the first time ever for a ballet in Ireland. Romeo & Juliet will be returning to Dublin in November 2015 together with The Tchaikovsky Perm State Ballet's famous production on Swan Lake.